I'm not Kirk. I don't look a thing like him. I can't even play Kirk on TV. He's a jazz saxophonist. I'm a classical French horn player. I mean, really. We're just worlds apart. But what I can do is bring you evening nonsense. 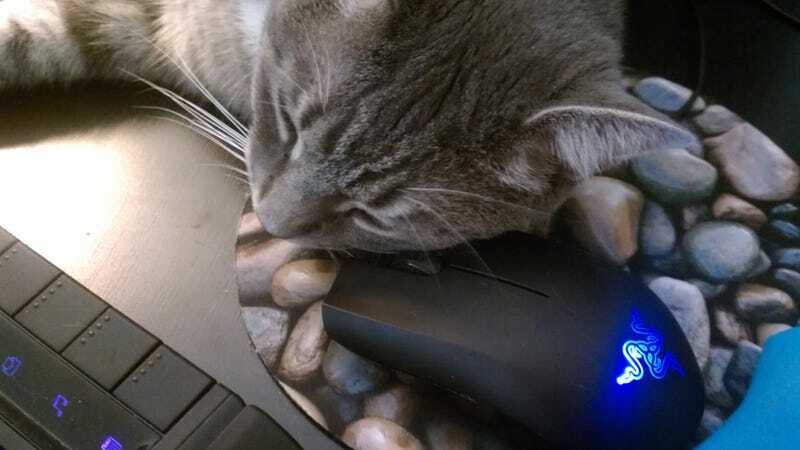 Despite the fact that Guybrush—an on-topic cat—has taken over my mouse and seems to be aiming for the keyboard. He's very sweet, but that does make it hard to work. Doesn't he know he doesn't go there? No. Because cats think they go everywhere. Especially these cats. There are even cats who want to play Pokemon. But cannot. Because they are cats. Now that you're tired of cats, feel free to chat about the weather. Or why French horns are awesome. The threads are open, and they're all yours. Or you can talk amongst yourselves.